Innovation does not end after successful prototyping — how a tool gets revamped based on the needs of its users and scales up to meet the demands of different groups is also part of the beauty of innovating for social impact. 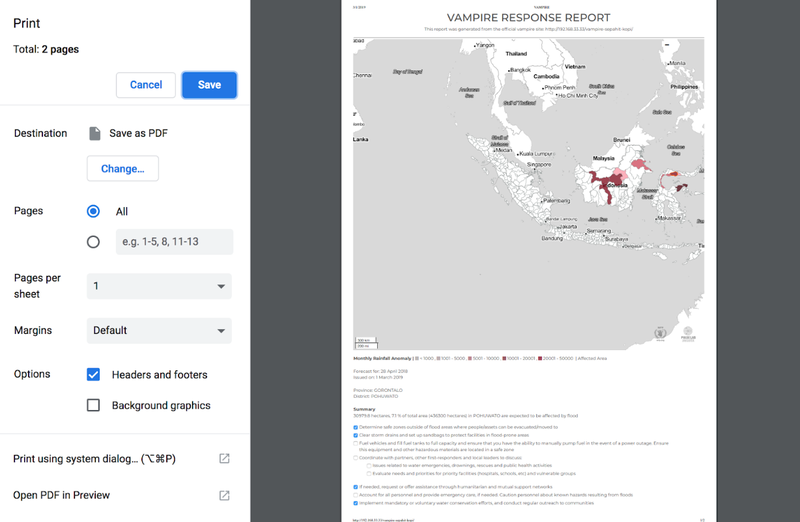 Our Vulnerability Analysis Monitoring Platform for the Impact of Regional Events, nicknamed VAMPIRE, was designed in response to the 2015 El Niño events to track the impact of drought on vulnerable populations in Indonesia. It has since scaled up to Sri Lanka where it was adapted to the country context and embedded in the Ministry of Disaster Management. Pulse Lab Jakarta and the World Food Programme recently upgraded the tool to enhance the user experience, which now enables more interactivity and easier access to data insights for reporting. 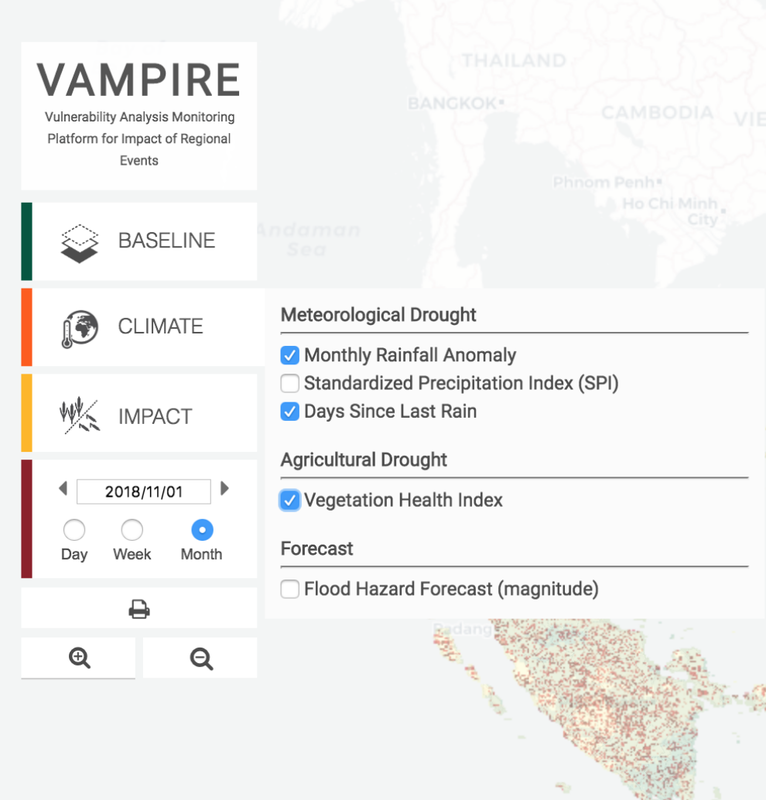 VAMPIRE provides integrated map-based visualisations that show the extent of drought-affected areas, the impacts on markets, and the coping strategies and resilience of affected populations. The tool is a multi-tier system that fuses several databases, including national socio-economic surveys, WFP’s household food security surveys, data on rainfall anomalies and the Indonesian Vegetation Health Index. Based on the measure of economic vulnerability and exposure to drought, the tool can identify priority areas where people may require assistance. Below we share a few screenshots of the tool’s features before and after its upgrade. The changes relate to navigating the data insight layers and the timeline that users first encounter. Previously, the data layers were accessible in a panel to the left of the screen, but it slightly interfered with the user’s ability to view the map visualisations. With the recent upgrade, this panel is positioned at the top of the screen with smaller icons that allow users to focus on the visualisations. The timeline box has also been extended, which allows users to adjust the cursor to whatever date instead of having to spend a lot of time clicking through. Users previously had the option to select multiple sub-layers in the main navigation. However, for users who are not familiar with the tool, this may cause difficulties in interpreting the visualisation during the same selected time period. The new version only allows users to select one sub-layer from the main layer, with the exception of the baseline layer that still allows users to select multiple indicators. Each sub-layer has its own time frame. Therefore, to simplify the way users view the visualisations, the timeline is separated for each selected sub-layer accompanied by basic information related to the selected sub-layer and the typical time frame of the data, whether it’s available daily, monthly or varies. By using the toggle button, users can find out for which period the data is available (indicated by the blue bar on the timeline). Besides tweaking how disaster history is displayed, changes were also made to create a more user friendly and interactive way to present the data for each year a disaster occurred. From there, users can click on a specific bar to see what disaster took place and click a particular period during that year to get more detailed information about the degree of impact. Instead of listing all the provinces and districts, users can now select from a dropdown list and then receive information that can be more easily interpreted in forms of graphs and tables based on specific information they are interested in. The socio-economic tab has been enhanced to include information on access to improved water source, poverty rate and the number of people employed in agriculture, forestry and fishery. The response checklist tab is a new feature that has been added to the tool. It allows users to select from a range of disaster response options. Designed with responders in mind, this feature helps with generating informational reports that focus on potential hazards for distinct groups. It also provides insights on what actions can be taken to increase preparedness for droughts and flooding events. These options correspond to the disaster type and magnitude detected by the system. Some of the disaster response options in the system include determining safe zones outside of the flood areas where people and assets can relocate to, setting up sandbags to protect facilities in flood-prone areas, among others. The report can also be printed before changing the selected options. VAMPIRE continues to chart change and impact decision and policymaking among government and development partners. The tool’s interoperability and modular design allows it to be easily adopted in different contexts, and its code in the coming months will be made open source for other stakeholders who may be interested in integrating the tool into their operations. By integrating data on flood hazard forecast and rainfall anomalies (from US Geological Survey and NASA), combined with population density data (from LandScan 2015 and Statistics Indonesia), the tool is able to deliver insights on flood and drought impact, such as areas of crops affected and number of persons at risk. We are always open to feedback that can aid in the tool’s development. If you have some ideas to share, please get in touch with us.